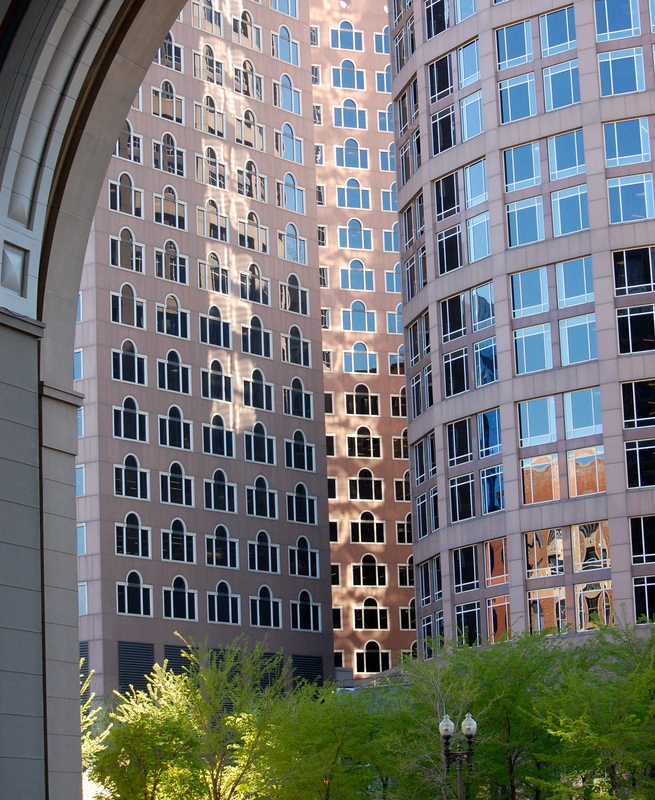 Sunday’s Snapshots – a collection of images of Boston, Mass. I took the photos in this post in Boston, Mass. in early May, 2013. They were taken in and around the wharf area and financial district. I love architecture so you’ll see plenty of that, including one shot of the cavernous look of the financial district. The Customs House Tower is perhaps my favorite building in Boston’s skyline. You’ll see an image of old and new construction – where the rounded corners of an old building were mimicked in the nearby new building. And from an artistic point of view, I love to see the scraggly outline of the branches of a tree against the methodically planned grid of a tall building. Nature retains its way despite the feats of geometry and physics that mankind builds around it. If you click on any of the photos it will enlarge and you can scroll though all the images full-sized. Enjoy! big sky in Boston, Mass.